When you are dealing with liquids at high temperatures or under intense pressure or you are dealing with potentially hazardous or corrosive liquids, it is important to get the right gauge glass. Gage Glass gives you a wide selection of gauge glasses to choose from so you can find the right gauge glass products for any equipment or application. Gage Glass prioritizes quality and customer service with every order, so the products you order are exactly what you need and you receive them in a timely manner. Getting the right gauge glass for your needs not only ensures that your equipment functions properly, but it also protects your facility, your assets and the safety of your workers. A low-quality gauge glass that breaks under pressures or cannot withstand high temperatures will cause even more problems than damages to your equipment. This is especially important if you are working with liquids at dangerous pressures, temperature or liquids that are highly corrosive. 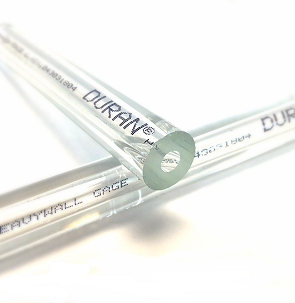 Heavy-walled tubular gauge glass provides the durability needed in nearly any application. Made from top-quality borosilicate glass, heavy wall tubular gauge glass is manufactured to stand up to the harshest conditions. The extra thickness makes these gauge glasses even more resistant to high temperatures, high pressures and corrosive liquids, so they won’t break, warp or crack no matter the application. Heavy-wall gauge glass is incredibly durable, but is limited to a maximum length of 48 inches to ensure stability.